Lean Machine Metal Fabrication Inc.
We have set out to build a robotic bending cell! We did an analysis on all of our bent parts and a large percentage of them are small enough to be bent by a robot on a 4ft press brake. Trying to be distruptive in manufacturing, we are stripping the brake of all controls and writing all of the logic into the robot controller. As far as we know, no one has attempted to use a “dumb” brake in combination with a “smart” robot. We found a “no name” press brake and we are using Motomans newest and best material handling robot. We are at the very beginning of this project but wanted to share some progress of the cell coming alive. One may ask the question; what does Lean Machine know about building equipment? The answer is nothing! We do know our own equipment well and it takes a lot of in-house technical knowledge to keep it performing at it’s peak. We also know how to integrate technology into our customer’s part manufacturing process and this project is an extension of that knowledge. As with all projects at Lean Machine this is to give our customers a better price on parts with a higher level of quality! This is the first part we want to bend. It’s small so the operator has to over-ride the safety light curtain on each hit which means the activation pedal gets hit twice per bend (4 times per part) which is brutal on an operator when a batch of 500 is the norm. Here is an overall view of the robot and brake. Lots of wires still hanging around during testing and start up. At Lean Machine we have recently added a Markforged Composite 3D printer, which has rapidly become a great new tool in our capabilities. 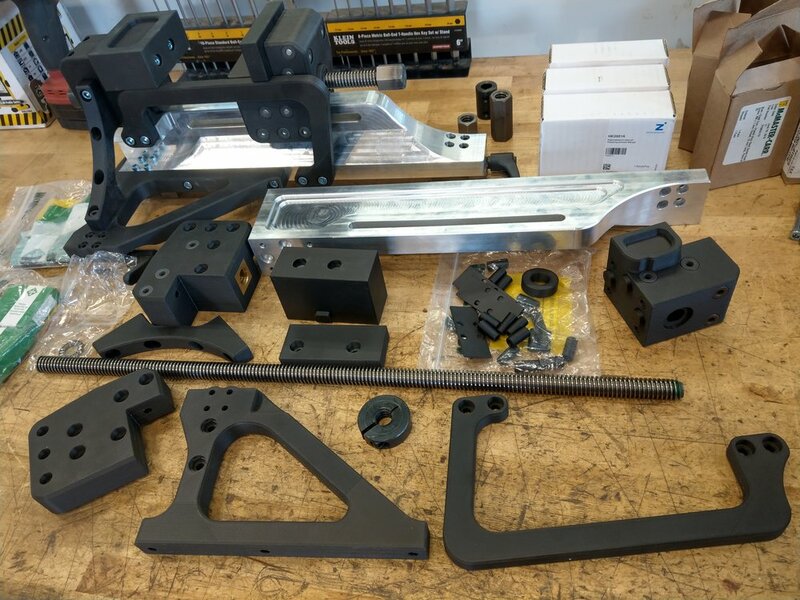 Besides the ability to print strong mechanical composite parts for Jigs, Fixtures, Workholding, Tooling, R&D, and other applications, we have been able to make rapid progress in DFAM (Design For Additive Manufacture). We're discovering new opportunities and intricacies in this design process on a daily basis! 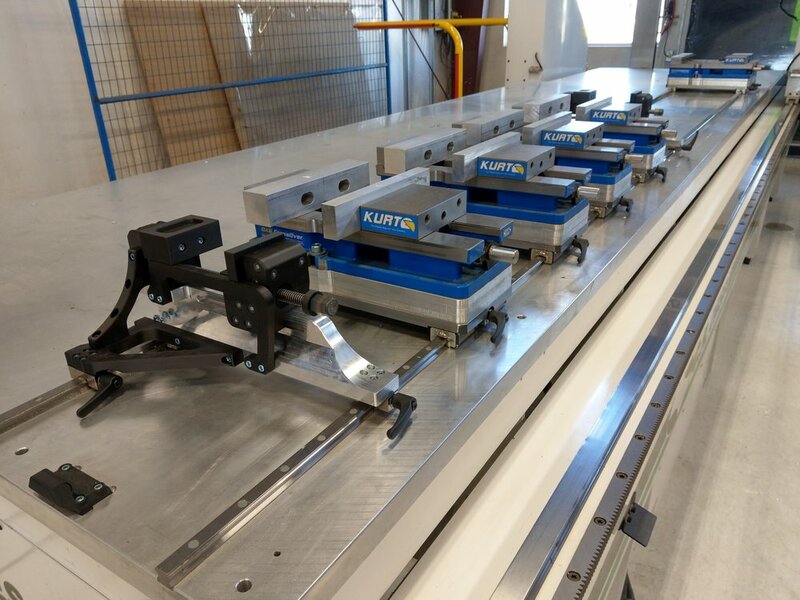 Our initial configuration for workholding on this machine was based off a previously successful design on another machine, and further improved, consisting of quickly-moveable machine vises down the length of the table. 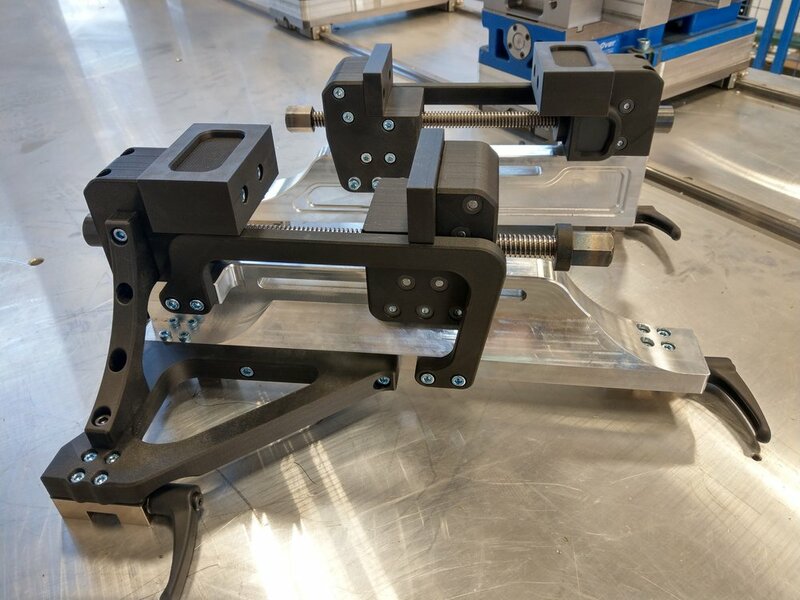 This had proven very effective on the prior generation extrusion workcenter, and we took it a step further with higher quality, more rigid components to maximize the capabilities. 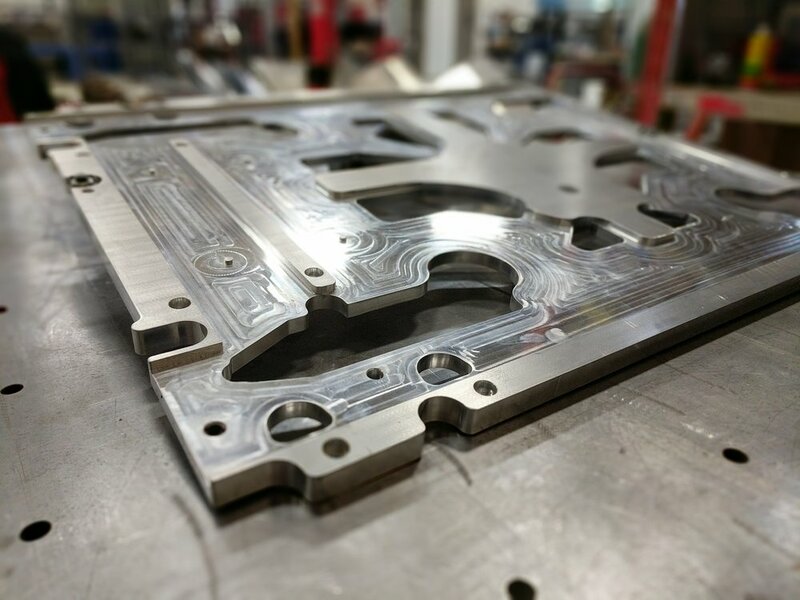 The challenge arose when we realized that to avoid machine collisions, the stickout of many workpieces was such that lighter cutting was required to achieve our standards of cut quality, so our Engineering team got to work on improvements to deliver greater performance. 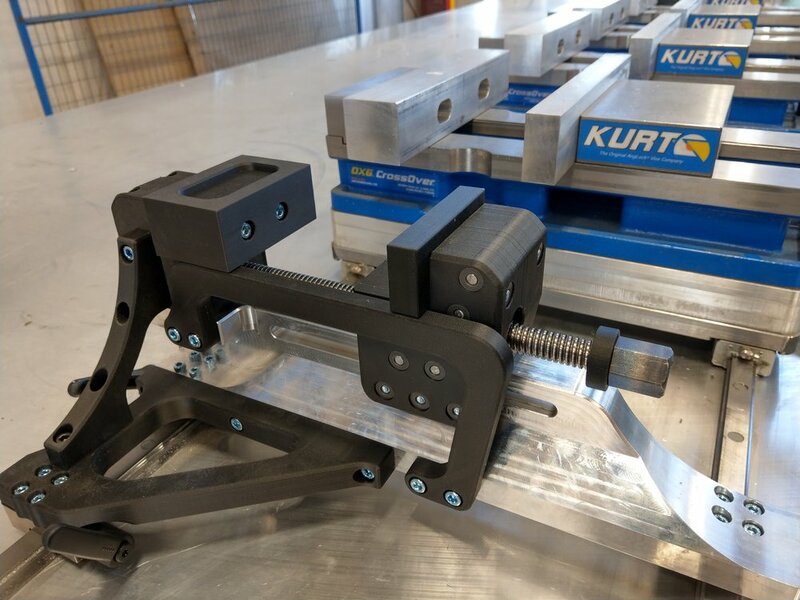 A new "Secondary" vise design was quickly developed in a matter of days, in fact designed entirely around the machine model, to bring the work holding as close to the end cut zones as possible. This new vise design incorporates Agile and DFAM design theories, and practical expertise from decades of Machining mastery. The choice to build many parts from purpose-engineered reinforced composites is no coincidence: These materials provide excellent dampening to vibrations from high RPM cutting, thereby delivering not only improved cut quality and speeds, but increased tool life as well. 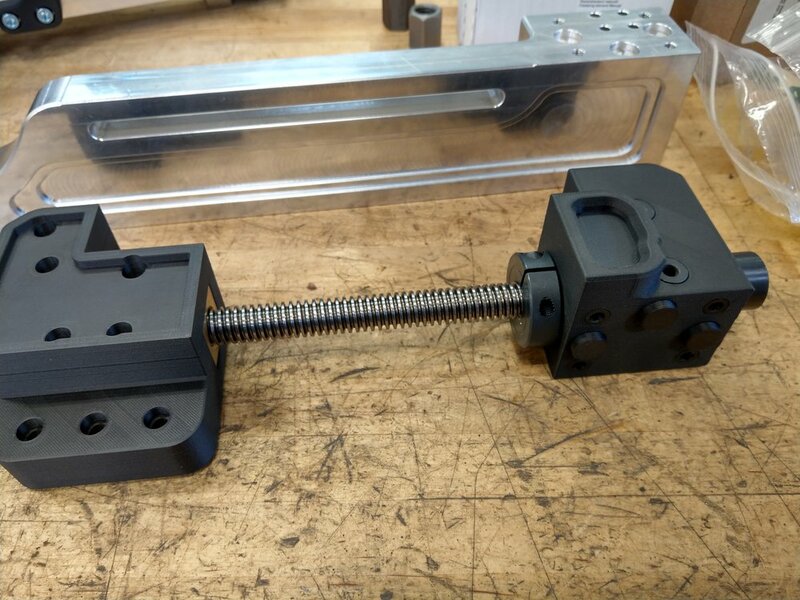 The hard-working mechanical parts that give a vise its clamping capability are of course made from metal alloys, using almost entirely off-the-shelf components (McMaster-Carr in this case, ever-popular among Mech/Mfg Engineers thanks to one-day delivery). 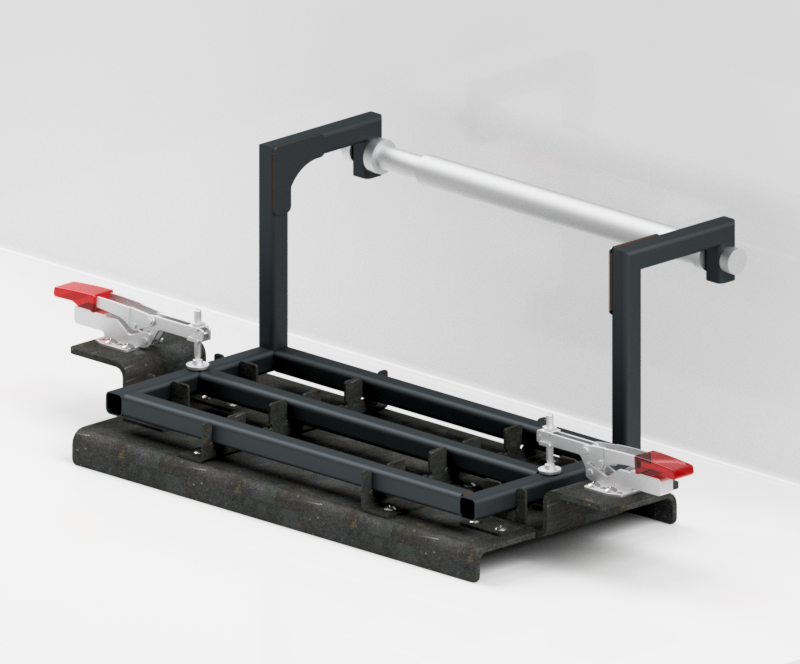 Roller thrust bearings, Steel and brass trapezoidal leadscrew components, and special hand-brakes for guideway mounting the vises bring the inner workings together. 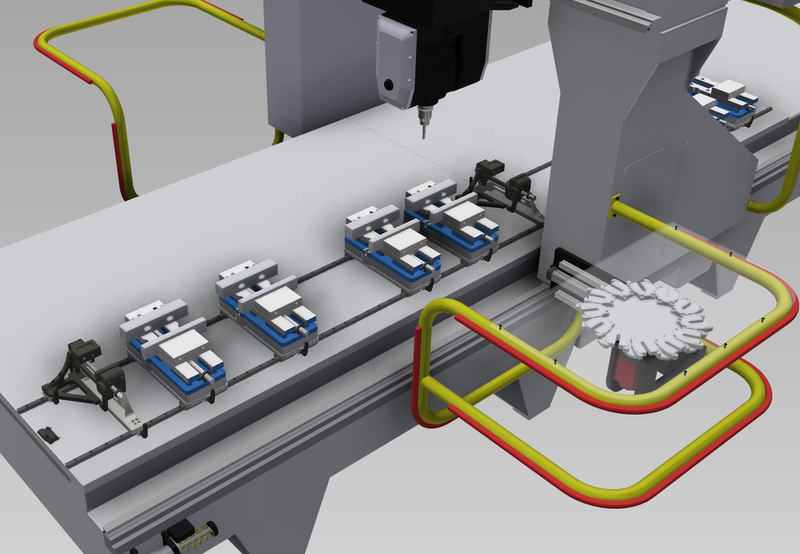 The vise bases are 5-axis machined in one operation on the same machine they are built for. Over two dozen 3D printed composite parts are used in each vise, but most of these are small pressed in parts to reinforce fastening areas. The larger parts are reinforced as necessary with either high strength fiberglass, or continuous carbon fiber, in areas that require greater mechanical strength, undergo heavier compressive forces and other stress. Metal components and fasteners can be printed into the parts, or pressed in afterwards. Unlike machined metal parts, the printed parts take substantially less time to program than to design. Printing them can take a days for larger parts, but the process is unmanned and scrapped prints are extremely rare. Assembly is a breeze, and the vises are ready for service! Thanks to the modular construction, any part that needs to be changed can be swapped on the fly, for example if a particular job requires a different jaw style. Time to make some chips! When we approached our electrician and said “we are going to rip all of the wires out of our walls” he replied like you would expect: are you crazy? With constant continuous improvement activities, we need the flexibility to move around offices, computers, and machines without having to pull wires through walls and figure out how to patch old holes. It was a little hard to tear apart walls that are only 6 years old but we decided to plan it out and do it anyway. Our solution to have a more flexible office (and wiring) was to build overhead cable trays. The trays form a halo around each room and all route from the main servers to each area of the plant. Along the way we also made some significant improvements to our ventilation system (positive pressure with an HRV, full zoning of every room, and increased filtration capacity) and found ways to make the offices easier to clean. CAUTION TO READERS: many terrible *before* pictures to follow and they aren’t pretty! Step 1: Move everyone out and share offices for a few months. The walls are dark grey with red accents, the ceiling tile is starting to turn brown, and the lights are using way too much power. Step 2: Rip out wires, run temporary wires, and say “what have we done”! Approximately 150 wires had to be taken out and re-run only to be later run again through the cable tray. Step 3: take down rest of ceiling tile and finish muddling and taping the ceiling. After some painting and new flooring we are part way there. Still tough working around all of the mess, wires, and construction noises but we have the greatest people who support progress at any cost! An extra improvement for our people was to switch to up/down desks as seen in this photo. Done! The hightlights of this picture are: the aluminum cable tray, the LED lights, the light sensor mounted to the bottom of the tray, some new personal storage lockers, lighter grey paint, and exposed ceiling tiles. This renovation also added space for 3 extra people in the same floor plan. The entire cable tray was designed in-house, built, and installed. The wire drops from the tray are surface mounted and have a subtle industrial look. This week we welcomed a new member to the Lean Machine family, a brand new CR Onsrud 5 axis Gantry mill. This incredible machine will allow us to process aluminum extrusions from all sides in minimal setups. Put in place and unwrapped the mill is considerably taller than our other machines and the machine fits perfectly in it's new home. This machine features a Fanuc control for X, Y, Z, C, A axis. The gantry is extremely heavy and rigid and features a water cooled spindle. Shallow cuts that are almost impossible on a saw (and inaccurate on a miter saw) are easily performed. Notice the Kurt Vises mounted to a linear rail for flexability in setup. Some cleanup being done on the bottom side of the tube. The Albrecht tool holder has a super long reach with tight runout for optimum balancing and tool life. Limiting the number of parts required to produce a design saves time, space, confusion, and alleviates jigging concerns. 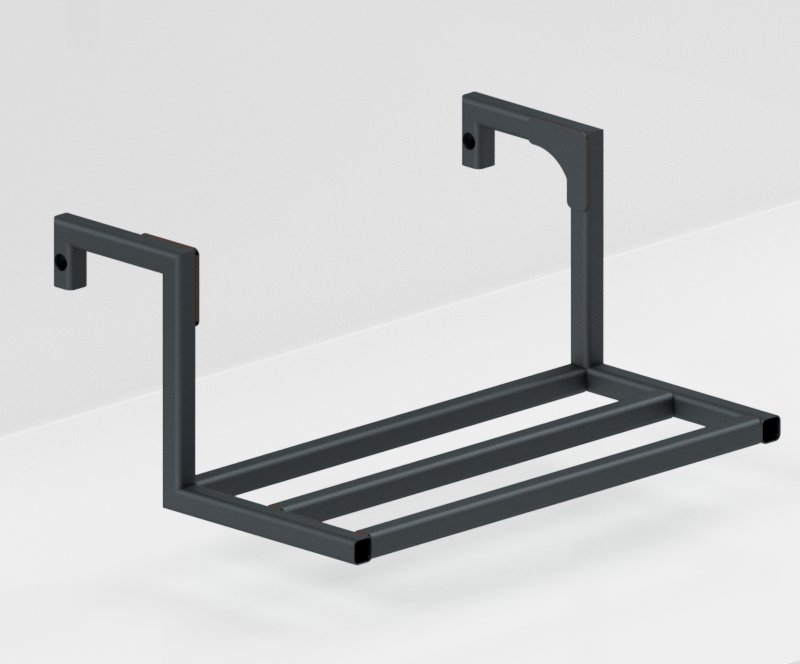 The upright components of this steel weldment would normally be fabricated from 4 miter cut tubes (8 parts per assembly) which would require a lot of careful alignment and handling of many parts. Rather than fabricating parts in that way, we machine holes and reliefs for bends which brings the 8 parts down to 2. Putting a steel tube across a CNC mill also ensures quality of cut squareness, length, and hole position. Our new bent tube also reduces welding and grinding by 6” (a 25% reduction). When a jig is required for final welding, the laser and brake can make quick work of that. This jig features easily interchangeable pieces and bolt together construction. 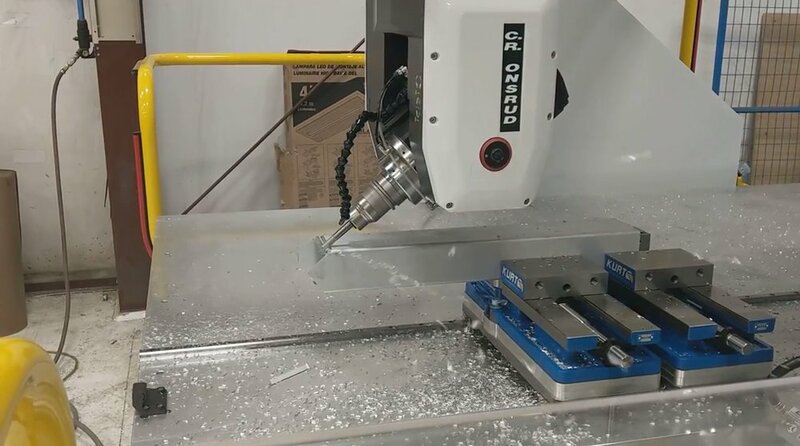 Our Onsrud CNC Router machines are great at cutting thin sheet, but their heavy build also makes them ideal for machining thicker pieces of aluminum. An advantage of using the router table is that it does not have the machining travel limits inherent in a more typical Vertical Milling Center, such as our HAAS VF4 machine. This means we are able to machine large parts in one operation, eliminating errors caused by part sensing and greatly reducing setup times. Below is video showing one of our Onsrud routers cutting a new welding jig for our shop out of a ¾” thick sheet of 6061-T6 Aluminum. After deburring, the part is ready to have components installed and be put into use as a robotic welding jig! Our awesome new Okuma lathe isn't just a lathe! This machine can turn round parts but can also mill perpendicular and parallel to the part. 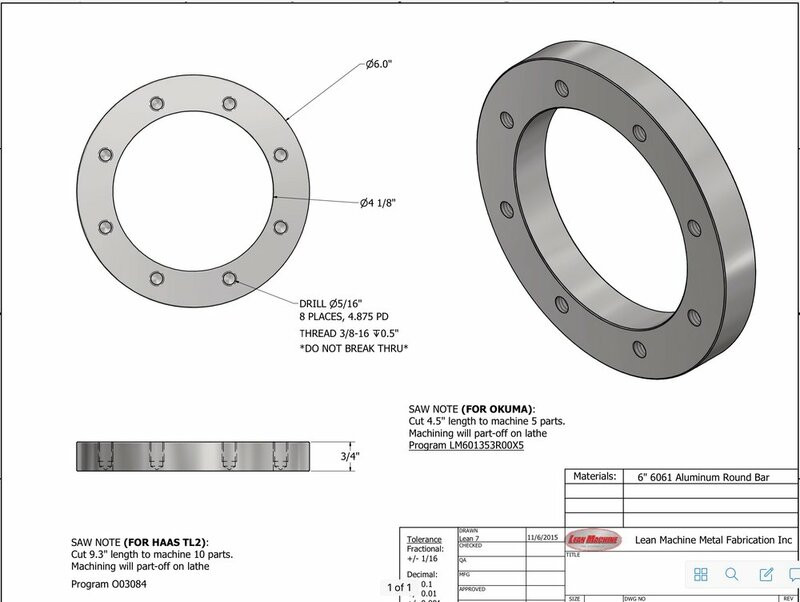 Here is a video of us making weld flanges for piping assemblies. The entire part is done in one process instead of turning the part in a lathe and then sending to a mill to put the bolt pattern in. The CAD drawing for the part shows the blind, tapped holes.